(CNS): Cayman Airways has said that the sudden closure of Cuba's Jose Marti International Airport by officials today due to poor weather conditions in Havana forced Cayman Airways flight KX832 to return to Grand Cayman. On arrival at Owen Roberts International Airport (ORIA) all passengers except three remained on board; the flight departed at 3:47pm and was scheduled to arrive in Havana at 5:45pm. Flight KX833 was then re-scheduled to depart Havana at 6:45pm, arriving in Grand Cayman at 6:45pm. This has also caused the delay of flights KX106, which is due to depart Grand Cayman at 8pm, arriving in Miami at 10:20pm; and flight KX107, which is now set to leave Miami at 11:20pm, arriving in Grand Cayman at 11:40pm. Passengers who are booked to travel on any of these affected flights today may call Cayman Airways Reservations on 345-949-2311 (within the Caribbean) or 1-800-4-cayman (within the United States) if they need more information. Meanwhile, Cayman Airways Express added six flights between the Sister Islands Tuesday morning to shuttle passengers from Little Cayman who were not able to travel on Monday because of inclement weather conditions. The heavy rains led to the cancellation of all Cayman Airways Express flights to Little Cayman and Cayman Brac. Passengers from Little Cayman were transferred this morning to Cayman Brac in order to connect with an added Cayman Airways jet flight KX2402, which departed Cayman Brac at 11:40am and arrived on Grand Cayman at 12:18pm today. 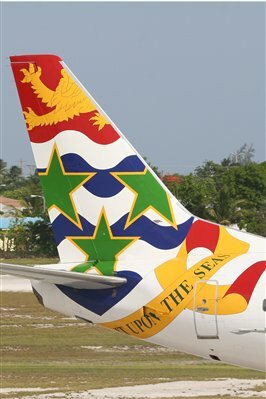 It is nice to see Cayman Airways finally getting some nice comments. So often we take the airline for granted and run down its staff and management. It is only during those times of absolute need that the airline really stands out to some. This type of customer service by any airline is unheard of in the United States anymore. Thank you Cayman Airways, there are not may airlines left that can rise to your standard. You may not have the best and newest airplanes but you certainly have a lot of other good things going right. Now how I get to Little Cayman? This is unwelcome. Thanks KX…you made my day!. Always good to have Sir Turtle come to the rescue. You do it well! I'm form the USA and from a small town with a regional airport that is serviced mainly by American Eagle. When situations such as these arise it is unheard of for American Eagle to put on extra flights. They just say "sorry there is nothing we can do becasue of the weather." Sometimes the wait can be up to three days just to get Dallas the American Hub. Most people end up losing the money on their ticket and driving which clearly is not an option from Little Caymn. I just want to say "Kudos" and big "Thank you" to Cayman Airways and its staff for coming to our rescue. To the people of Cayman I say, be proud of your national airline, it stands (or flies) way above the American carriers not only in outstanding customer service but also the care and dedication of the management and staff makes it one that I will use whenever I visit the Cayman Islands and will recommend to all my friends visiting your beautiful islands. Thank you again for making what could have been a vacation disaster a very happy one. My wife and I will be back and we will fly Cayman AIrways! if you look at the article, it's clear the airline retimed flights to protect passengers … NOT "excess capacity" allowing for the flexibility. KX goes out of it's way to accommodate passengers. This same attitude is crucial when it comes to inclement weather – lest you forget how KX increases flights (late night, etc.) during hurricanes, tropical storms, etc.? Because CAL doesn't overbook/double-book seats like major carriers, & focuses on service & offering a variety of routes & useful flight times/schedules they will have excess capacity; as opposed to only flying if they know they will be ram packed with people, which is not good service at all. Yes it costs, but they are marketing for more business & opening new routes so aren't idly sitting by. Great service will win more customers. You moaning idiot. I recently returned from the US with Cayman Airways when it was raining heavily on Monday, & was delighted to see that CAL had staff handing out umbrellas for the passengers to use in getting to the terminal! EXCELLENT customer service & thinking ahead. WELL DONE. Pity that on the flight there was no rum or punch for rum or fruit punches, but I made it through nevertheless.